The Release Diet was created by Deb Cheslow and Angie Flynn believe that physical transformation begins on the inside – with the self-image of the person who is executing the plan. So they developed a strategy for weight loss that helps you embrace change and break free from self-imposed limitations. This program is outlined in their book, Release: The Simple Success Solution for Real and Permanent Weight Loss. It focuses on creating a positive attitude and overcoming self-sabotage, while offering practical weight loss advice. The authors didn’t want to offer their readers “just another diet”. So they created a lifestyle plan that is energizing and pleasurable that will work for everyone. Their program can help you release excess weight and adapts to your body as it changes. This way you don’t experience weight loss plateaus and can continue to lose weight and keep it off forever. Focus on your belief that you can create a strong, fit, healthy body. Examine the habits that are stopping you from achieving your goals. Develop a strategy to turn negative habits into positive ones. You will gain increased self-awareness about your thoughts and behaviors, which will naturally move you toward healthier choices. When this is combined with a practical diet and fitness plan it will be easy for you to lose weight. The Release Diet is based on six small meals a day, containing approximately equal portions of protein and carbohydrates. These meals should be regularly spaced apart in intervals of about 2-3 hours. At least two of the meals should contain non-starchy vegetables. You will follow a strict meal plan for the first 30 days. It takes this long to retrain your brain so that your new way of eating becomes a habit. To make food preparation easy you can use meal replacements or protein shakes for two or three of your daily meals. 1 serving of protein roughly the size of the palm of your hand and ½ inch thick. 1 serving of carbohydrate the size of your clenched fist. The authors explain that amino acids can only enter your cells to regenerate them and rebuild tissue in the presence of insulin. Carbohydrates trigger the release of insulin. So to ensure proper cellular function you need both protein and carbohydrates in every meal. They say this is the reason why severe restriction of carbohydrates is not healthy for you. At the end of the first month you have one free day each week, where you can eat anything you want. You also don’t do any exercise on this day. Your calories should be about double of what you normally eat. This keeps your metabolism running smoothly and prevents weight loss plateaus. It also helps to reduce cravings because you know that you are allowed to indulge at the end of the week. Throughout the plan you can have a glass of red wine, two or three days a week. But beer and liquor should be reserved for free days only. Chicken breast, turkey breast, tilapia, cod, haddock, tuna, salmon, shellfish, lean beef, buffalo, lean ham, organic eggs, low-fat cheese, nonfat Greek yogurt, protein shakes, nuts, potatoes, brown rice, whole grain pasta, oatmeal, quinoa, beans, apples, berries, oranges, grapes, asparagus, broccoli, bell peppers, green beans, mushrooms, spinach, tomato, zucchini. Ideally you will exercise six days per week. For three days a week your fitness plan should include cardiovascular interval training. On the other three days you will perform strength training exercises to build lean muscle. The combination of these activities elevates your metabolism and maximizes fat-burning. 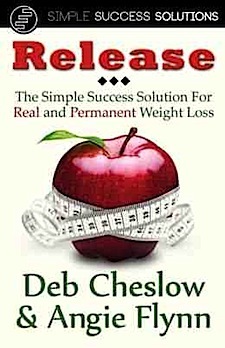 Release: The Simple Success Solution for Real and Permanent Weight Loss retails at $19.95. Addresses the psychological obstacles to successful weight loss. The Release Diet does not require calorie counting. Free day reduces cravings and makes it easier to stick with the diet long-term. Necessary to prepare six meals every day from scratch, or otherwise rely on meal replacement shakes. Meal plans appear to be lacking an adequate amount of fresh fruit and vegetables. Some dieters may consume an excessive amount of calories on the free day, which can slow weight loss. The Release Diet focuses on helping you identify the ways you may be sabotaging yourself from achieving your weight loss goals. It offers advice for personal transformation combined with a practical plan to help you achieve your ideal physique.